In recent months, heated exchanges about Burlington Telecom have led to lengthy city council meetings, exhausting the participants and audience members in attendance. Yet one city councilor seems to thrive on the chaos: Ed Adrian. The ongoing debate has allowed the Ward 1 Democrat to demonstrate his prosecutorial power. In so doing, Adrian has earned a reputation as a tireless watchdog of the Kiss administration. He’s also managed to piss off just about everyone. Elected to the council in 2007 to fill the remaining term of outgoing Councilor Ian Carleton, Adrian has been described by opponents — and, at times, by supporters — as egotistical, bombastic, tenacious and self-absorbed. He’s also been characterized as a “bull in a china shop” or simply “a real jerk” by colleagues in all political parties, including his own. Roughly a year ago, Adrian and a fellow Democratic councilor used parliamentary procedures to repeatedly interrupt debate on a zoning ordinance, in an effort to delay a crucial vote. The tactic so infuriated former city council president Kurt Wright, a Republican, that he called police officers to Burlington City Hall Auditorium. The threat of forcible removal quieted Adrian somewhat but not entirely: He repeatedly questioned Wright about the police presence — for the cameras — thereby guaranteeing that it became a news story the next day. Asked about the incident, Adrian admits he has pushed Keogh too far sometimes — often urging Keogh to shut off a speaker if Adrian feels he or she is going on too long. “He doesn’t take it personally and I’ve apologized to him subsequently,” said Adrian. Keogh has yet to call the police on his fellow councilor. “I’m sure the time will come,” Adrian said wryly. Along with his confrontational demeanor, Adrian, who turned 40 in December, can be physically intimidating: He shaves his head and has a goatee; thick-rimmed glasses enhance his intensity. And he doesn’t just enter City Hall Auditorium, he practically charges into it — whether he’s coming from a quick nosh, or the bus stop, or an earlier council work session. There’s an urgency in Adrian’s gait, as if he can’t wait for the meeting to begin. When it does, he’s usually either perched on the edge of his seat, looking over a series of questions he’s scribbled on his legal notepad, or leaning back in his chair as if waiting for the defense attorney to rest his or her case. If Adrian looks like a lawyer ready to pounce, that’s because he is one. He’s been a prosecutor for 13 years, first for the Franklin County State’s Attorney and now for the state Office of Professional Regulation. Adrian is relentless as an inquisitor, and often has to be reminded by Keogh to wrap up his questions so other councilors have a chance to ask theirs. Adrian points to the often long-winded and oblique responses given by Jonathan Leopold as a case in point. Adrian won’t apologize for locking horns with the city’s CAO. He does it on a regular basis. Adrian grew up in the northern New Jersey town of Allendale, a Manhattan bedroom community. His dad was a dentist; his mom, a schoolteacher. His only sibling — a younger sister — is an architect who also lives in the Burlington area. He lost, but picked up close to 35 percent of the vote. And he was hooked. Adrian studied political science at the University of Vermont. After graduating in 1992, he traveled to Portland, Ore., for a year and then returned to the Green Mountains to attend Vermont Law School. After three years in South Royalton, he moved to Burlington and started to get involved in local politics through fellow law school grads and some of their younger, progressive-minded friends. He married graphic designer Jennifer Karp and now has two kids, ages 6 and 3. That Adrian is a Democrat has everything to do with a poker game. No, he didn’t lose, or win, a hand. Instead, Adrian joined a long-running poker game hosted by local Progressives: Phil Fiermonte, a longtime aide to Bernie Sanders and a city councilor; Peter Sterling, an activist and former Sanders campaign manager; and representatives David Zuckerman and Chris Pearson, among others. Adrian said he joined the group after being invited by Mark Heyman, another young, progressive-minded Burlingtonian. But in 1998 Heyman ran as a Democrat alongside incumbent Rep. John Tracy in a two-seat Burlington House district. The other incumbent was Rep. Steve Hingtgen, a Progressive. Heyman lost, but was subsequently disinvited from the poker game. Adrian decided he would rather seek out a party that offered more political give-and-take than the Progressive Party, which he sees as more ideologically rigid. It wasn’t until 2005 that he took the leap and ran for office himself. That year, Adrian challenged longtime Ward 1 Independent Sharon Bushor, a Progressive ally, and lost by a hair. When Ian Carleton was ready to step down from his Ward 1 seat, he approached Adrian, who won the seat easily. Keogh recalls that Adrian brought a new energy to the Democratic caucus at the time. “He came in with a great degree of assertiveness, which was different, so the rest of the caucus had to adjust to a new style that we had not been accustomed to,” said Keogh. That “assertiveness” has not gone away, notes Keogh, which means Adrian often spars with fellow Democrats. Councilor Joan Shannon (D-Ward 5), who has been on the council since 2003, says she and Adrian are the most likely to disagree within the caucus. But no matter how much they conflict, Adrian is always the first to call or check in later to make sure the disagreement hasn’t adversely affected the relationship. Shannon said Adrian’s tactics have made him a lightning rod for critics, perhaps undeservedly so. Former councilor Carleton said this may mark the beginning of a shift in the city’s political power balance. Democrats see an opportunity to fill a leadership void created by Mayor Kiss, who not only lacks charisma but takes an almost Quaker-like approach to politics. But for every Democrat egging Adrian on, another is urging him to show more restraint. After several consecutive tumultuous meetings this fall, Democrats on the council began to voice concern that Adrian’s temperament during the meetings could backfire politically and hurt their reelections. He’s been asked to cool it. In the meantime, Adrian’s critics are worried about the damage he’s already done to Burlington’s progressive legacy. Fellow Ward 1 Democrat Sandy Baird, a former state lawmaker who has had her own public battles with Progressives, agrees. She believes that Adrian’s actions, if allowed to continue, could be detrimental to not only Democrats but the city as a whole. “From my observation, and I can only speculate, I think that Ed is an ambitious guy and he is acting the way he is acting in order to replace the Progs on the city council and in the mayor’s office, and he’s using this crisis with Burlington Telecom to advance his own career,” suggested Baird. Perhaps, but Adrian has already dismissed a run for the Vermont House, and says he has no intention of running for mayor in 2012. 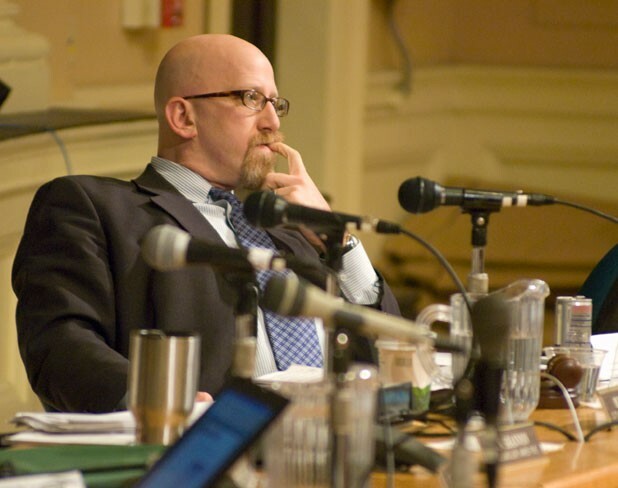 ***** Two corrections from last week's profile of City Councilor Ed Adrian ("City Councilor Ed Adrian is Burlington's Political Provocateur"): He first ran for city council in 2005 (not 2006) and he grew up in Allendale New Jersey (not Allenwood).